NASHVILLE, TENNESSEE – We spend a lot of time at Millionairium discussing SEO, and that’s no surprise since we’re striving to be the best SEO company around. However, the truth is that ranking our clients at the very top of Google is only part of the battle. Businesses want to be number one on Google for one reason only: to increase their sales. We provide SEO services for many different types of companies, including dental practices, orthodontic practices, e-commerce websites and law firms, and each client has the same goal. Each client wants to know how much their business has grown since they signed up to work with us. Let’s take a law firm as an example. For a lawyer, SEO success may bring him many more inquires than he had before, but how can our lawyer tell if these inquiries are leading to new, paying clients? Does increased traffic always mean increased business? We understand we must not only track how well our customers are ranking on Google for specific keywords, we must also track how much business is being converted because of our SEO campaigns. It may be relatively easy to track conversions using Google Analytics if your business is coming only from the web. You can use specific tools to track how many users reach a download page, assuming your business sells something downloadable. For instance, if you’re selling an e-book, you can track how many people reach the download page, therefore conversions are easily monitored. With Google Analytics, you can even see the keywords that eventually led customers to download your e-book. While this information can be helpful, it doesn’t provide a complete picture of how you’ve converted your customer. He may have searched “mystery e-book” on Google, which could have led him to a forum on Goodreads, a popular social networking site for avid readers. Your buyer could have read about your book there and decided to visit your website to finally purchase your book. He may have visited Facebook or Twitter before his purchase. How can you track this chain of actions that eventually converted him? Google Analytics shares a fantastic video about the steps it takes to make a final conversion using the analogy of a basketball game. The player who shoots and scores gets credit for the goal, but other players were integral to the entire play. You can use the Google Analytics Multi-Channel Funnels to see how your customer behaved 30 days before he finally purchased your book. This gives you a complete picture of how your marketing efforts have paid off, and it takes the focus off solely the last “player,” if you will, to score the goal. Last-click conversion isn’t as helpful to marketers as viewing the entire chain that sent a buyer to his final destination. You want to see how your customer has interacted with social media outlets, organic search results, emails, newsletters and banner ads before they decide to purchase your product. This insight is an invaluable tool that lets you see which marketing channels are most effective for your target market. Conversion tracking gets trickier, however, when visitors are finding information on the web and then calling businesses for appointments. New customers could have found your business through Google Maps SEO efforts and then visited the business in person for an appointment. So how do we effectively track how much business we’re bringing you if customers aren’t necessarily visiting your site? Not many web-marketing companies are able to capture conversion rates effectively and scientifically. Millionairium Marketing aims to be one of the best marketing companies for tracking new business conversions. Jellyfish, a UK digital marketing company, agrees that tracking offline purchases is difficult, but the more online exposure you have, the more likely you are to gain new business. While tracking offline conversions may be hard, it’s not impossible. For businesses that provide services, such as dentistry practices and law firms, we can use contact forms to see how many inquiries are coming from the Internet. From these inquiries, the SEO client will know how many new clients they’ve gained in the past month, the past quarter or the past six months. However, many of us still like to pick up the phone. It’s not realistic to expect our clients to ask their potential customers how they found their website. Even if they did, this isn’t really an accurate or scientific way to measure results. For instance, if you are running an AdWords campaign along with an SEO campaign, more often than not, your customers cannot tell you whether they found you on the Ads or on the organic results pages. We can provide traceable phone numbers on your website, and these phone numbers allow us to accurately count how many new clients are coming from the Internet, even if they’re picking up the phone for an appointment without visiting your site. This is a hot topic in the SEO world right now. Keyword reports are becoming less important as clients want to know exactly how much new businesses is generated from their increased rankings on Google. And that makes sense, right? We are currently using Marchex, which is a very user-friendly phone tracking and phone-recording software used for this sole purpose. We can track and record every single call that goes to our clients’ business and provide them with a back-end administrator panel that they can see all the calls, where they were generated from, how long the call took and even listen or download the call. 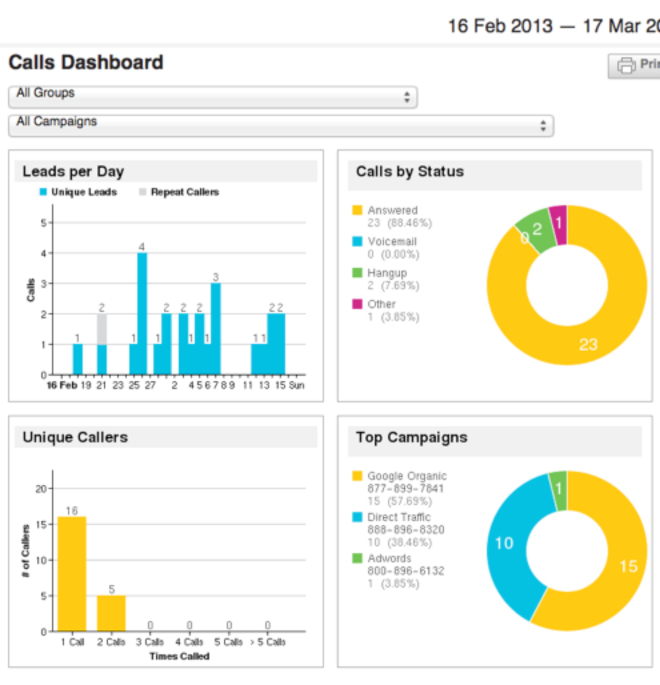 We can also monitor where the calls are coming from including organic, direct or pay-per-click advertising. We can even track the success of a specific post. For now, what methods have you used to track conversions for your SEO clients? Hi Jessica, I\’m really proud of your post for giving me some informative tips. SEO is a great factor for me and I\’m always after SEO in legal ways, that means through white-hat techniques. I don\’t always get time to analyze my site but I do try to get help from online free SEO tools to do this job and take action as per their suggestions. Thanks. I\’ll come back again. That is true that it\’s easy to track conversions using Google Analytics if your business is coming only from the web. With Google Analytics, you can even see the keywords that eventually led customers to see products or a website you\’re providing. Keywords are really important to the title of your product/website or anything where you have business using the web, because Google Analytics will first read the keywords that you used. Ya, I agree with you. The points you have mentioned are amazing. SEO is important for brand promotion and it increases our conversions. Through the conversion tracking we can check how much SEO is effective. Great article Jessica. Thank you very much for the insights. I\’m looking forward to learn more about Google\’s Multi-Channel Funnel. Marketers must first determine what qualifies as a conversion and where the conversion happens. Conversion monitoring does not rely on this stage of complexity, but the marketer can only improve their strategy at the stage they track. SEO is important to clients cause they hope by this service their visibility increases and gets more clients, Conversion tracking is the way to show them how much SEO is effective to their businesses and also helps them to find the most effective ways to get clients and spend more budget on them. Search engine marketing is a part of internet marketing which basically involves purchasing ads and increases promotion by gradually increasing the visibility and searches in search engine result pages through advertising and optimization. Would you give me an example of white-hat SEO?